This is where Eric Clapton used to live when he was in Cream. Description: The Pheasantry is an historic Georgian building originally used to raise pheasants for the royal household. It's had many distinguised residents including Australian artist Martin Sharp, Augustus John and Annigoni. In 1976 the six-year campaign to save The Pheasantry from dereliction reached a peak. 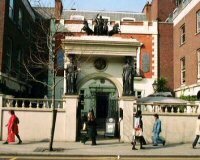 Under the patronage of Sir John Betjeman, [whose photo you see on the left] the Friends of The Pheasantry wanted the building restored with residential studios, an art gallery, and exhibition space. They were not successful in preventing the adjoining development, but the front and gateway of the Pheasantry survived, heavily restored, as part of the rebuilding of 1971-81, forming a restaurant hemmed in by shops and offices. It now houses Pizza Express on the ground floor.